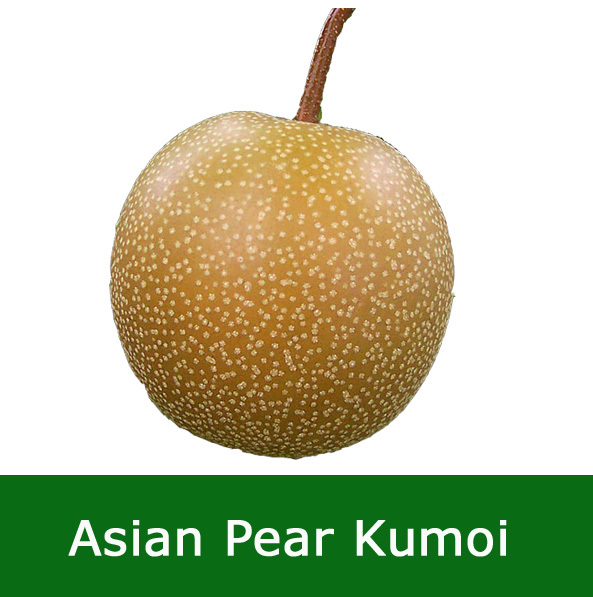 Kumoi Asian Pears (Pyrus Domestica Kumoi) provide excellent eating pears and very interesting ornamental properties to add eye pleasing aesthetics to any garden. This fruit tree is SELF FERTILE which means it will provide fruit without the need for another pollinator. In plain English, plant it where you like, it will provide fruit although close proximity to some secret Government labs may influence your results! Our Kumoi Asian Pear trees are supplied approximately 1.2-1.8 metres tall and are supplied on a Quince A/Pyrodwarf rootstock. Asian Pears combine the distinct flavour of pears with the crispiness of apples. Expect a final height of around 4.0 metres although pruning or restricting the root spread with containers will keep final height lower. The Kumoi Asian Pears will be ready for eating in September and can be kept in the salad crisper part of your fridge for at least a month, possibly three. Kept at room temperature you can keep for up to 14 days, 2 weeks or half a month, which ever is longest! A good addition to any fruit salad or even in some stir fry dishes.